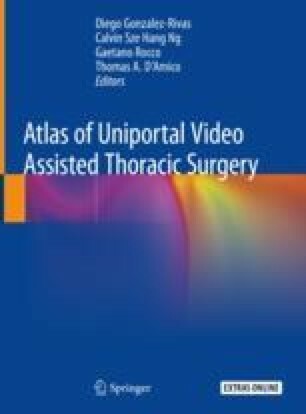 Uniport video-assisted thoracoscopic surgery (VATS) was first reported in the mid-2000s. Since then, it has become an increasingly popular surgical technique for most thoracic surgery, and it has similar treatment outcomes that are comparable with those of traditional multiport VATS techniques. Unfortunately, postoperative wound discomfort and intercostal neuralgia have been found in a significant portion of patients [1–4]. The online version of this chapter ( https://doi.org/10.1007/978-981-13-2604-2_37) contains supplementary material, which is available to authorized users.